Invitation to a weekend in Italy! Are you ready, will you come along? Yes, I'm more than ready. 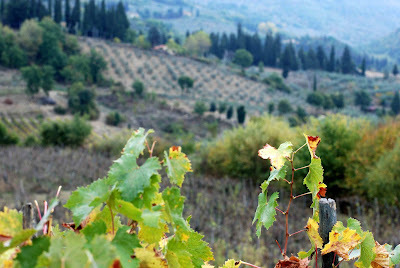 Tuscany is someplace I have always wanted to visit. I think its a photographers paradise. Ok, my sealtbelt is fastened...let's go! Heaven.....Have a wonderful weekend, xv. Lovely -- those tall columnar trees seem so characteristic. Are they Lombardy poplars? Or what? And lucky you to be there! 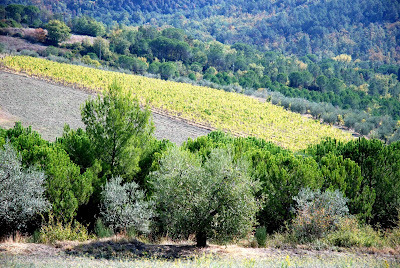 These are Cypress trees, so characteristic of Tuscany. Click here to read more about this magnificent tree, "The Italian Cypress Tree". 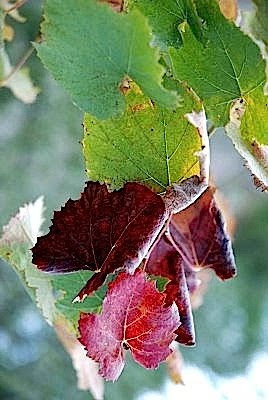 Tuscany has wine-colored leaves . . . how lovely. Well Merisi, as autumn chill and rain advances on to NYC, you have kindly shown us some brillian light in other places. Small world ... do you know those books about under the Tuscan sun, by F. Mayes? One of my paintings is housed under the roof of her house. FABULOUS pictures...it looks like a piece of heaven! Stopping by to see the beauty of autumn in your part of the world. Just lovely. Thanks for your kind thoughts, Merisi. They were much appreciated. I will still visit you often. Ah, the tourists have left, the vineyards are ready to harvest, and the air is crisp. Lovely. Thanks for taking me with you. I had an enjoyable time. I can't wait to hear which poems will be your favorites! we all crave for sun and light when autumn's chill and grey weighs heavy on us, don't we? One of your paintings hang in Francis Mayes' "Bramasole"? I am in awe! A dear friend gave me her first book, it was so wonderful dreaming of being back in Tuscany. I hope your projects are coming along well! no tourist in those hills, the hike up there was hidden away, starting in a ravine by a little brook and leading up through woods to the olive grove. Why oh why am I not there with you today. Gorgeous. in my heart, the Carolinas are just as beautiful as Tuscany! I hope the spell of surprisingly cold weather is but a memory now and the sun's back in your part of the world! Lovely atmosphere...I must go there! 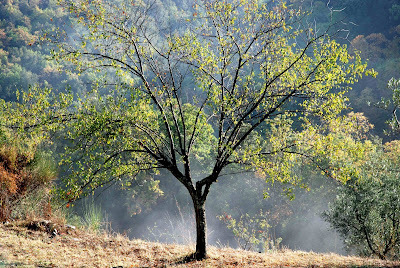 I love the landscape photos...especially the solitary tree. Inspirational! I have always wanted to go to Tuscany. Ever since the book, I wish to be there! This selection of photos are particularly dreamy. I just love that first shot of the tree. You are a wizard behind the lens. Thank you for taking me along. I havn't been there for quite a while now and very much enjoye the light you captured. The changes in the quality of light from place to place have always intrigued me.